Another story in the 30th anniversary issue of Veranda that resonated with personal relevance was the icon selection in the style section celebrating the timeless appeal of toile. Ever since 1760 when Christophe-Philippe Oberkampf founded his textile factory in Jouy-en-Josas outside of Paris, Toile de Jouy has been a mainstay in the world of design. With designs celebrating not only scenes of bucolic life but the scientific and political accomplishments of France, toile became the ultimate storytelling tool. 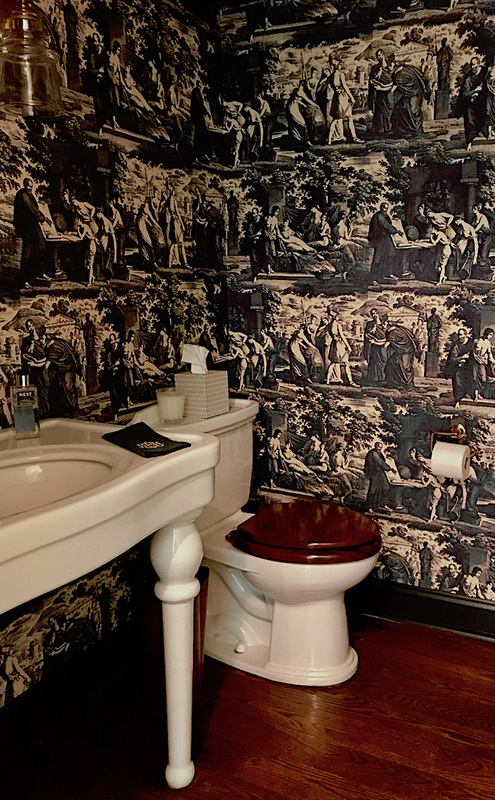 I have always loved toile for its visual narrative and several years ago when I was searching for a wallpaper for my powder room, below, immediately fell in love with one David Netto used in Gil Schafer‘s magnificent update of Boxwood. 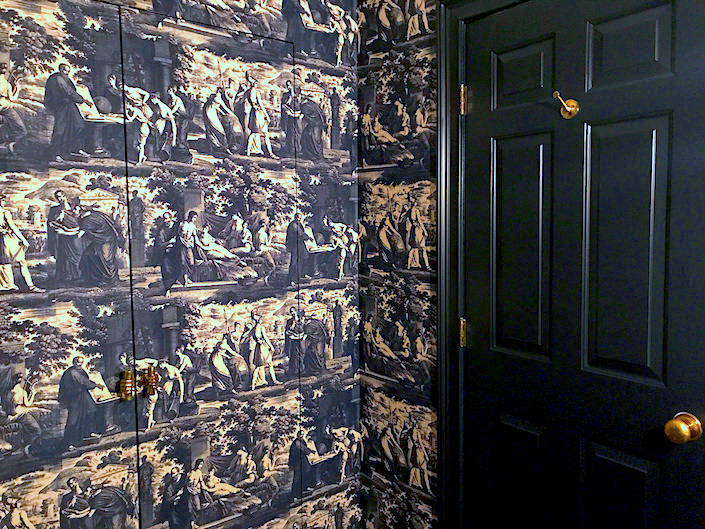 The dark inky toile, at the time distributed by Lee Jofa for Cole & Son, was perfect for my windowless room, which I wanted to totally envelop for a men’s club ambiance. I snagged the last few roles as it was being discontinued. Fast forward to earlier this year when I posted a peek of the room on Instagram. 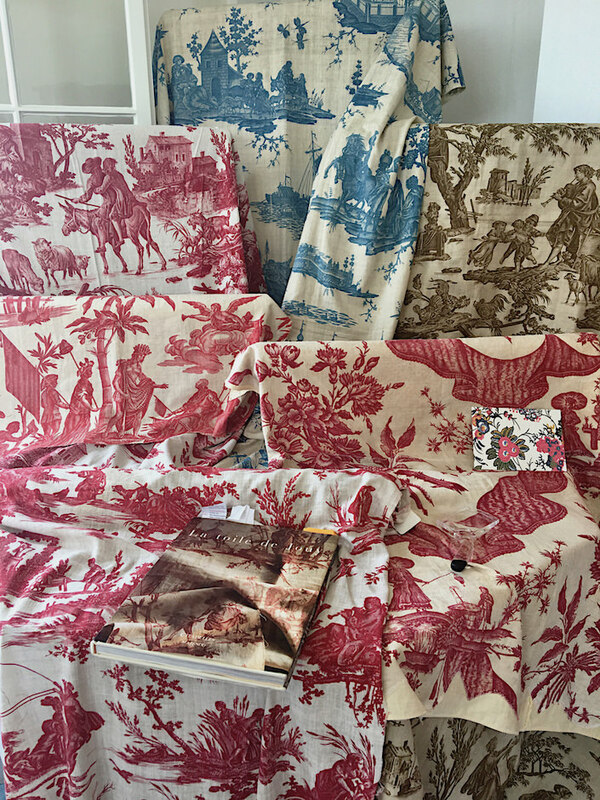 In a fun story-behind-the-style coincidence, toile expert/manufacturer and instafriend Christopher Moore, aka The Toile Man, came forward to elucidate the details of the pattern, which turns out to be one of his, now available directly through his site. (a version in sepia below). and jib doors hide a capacious closet while allowing the toile story to unfold. 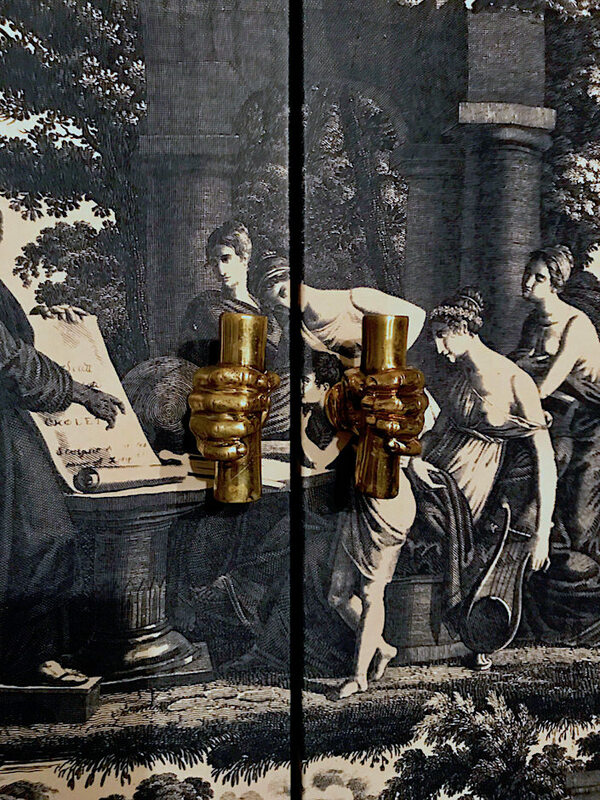 Soane’s classic hand pulls were the perfect foil for opening the jib doors with understated style and whimsy. 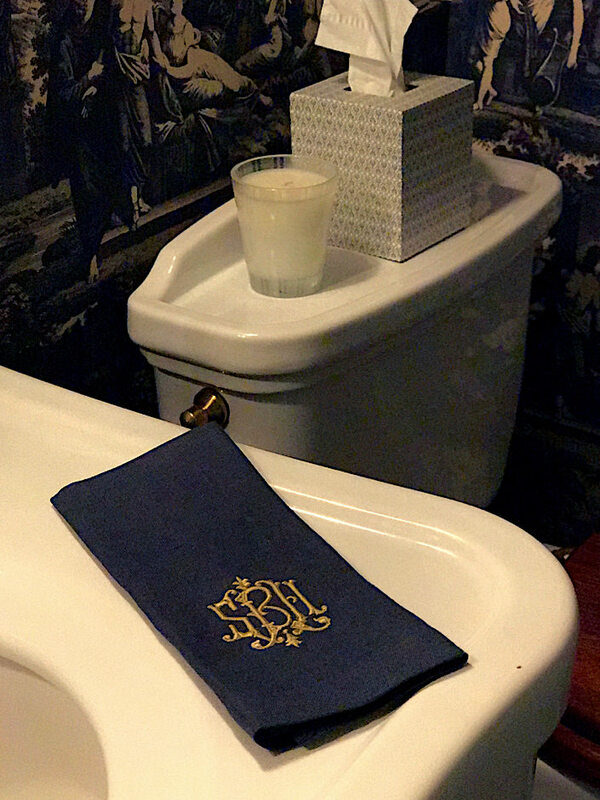 And it also allowed me to add accessories from a few of my favorite creative friends – hand towels from Leontine Linens, NEST Fragrances Moss & Mint candle, and tissue box cover from Scanlon Apparati (available through Hollyhock and KRB). Lastly, I loved seeing a shout out to the Toile de Jouy International Foundation in Veranda, whose founders sponsored a lunch with editor in chief Clinton Smith on Nantucket I attended. Clearly, the timeless appeal of toile continues to inspire! This entry posted in design, history, interior design. 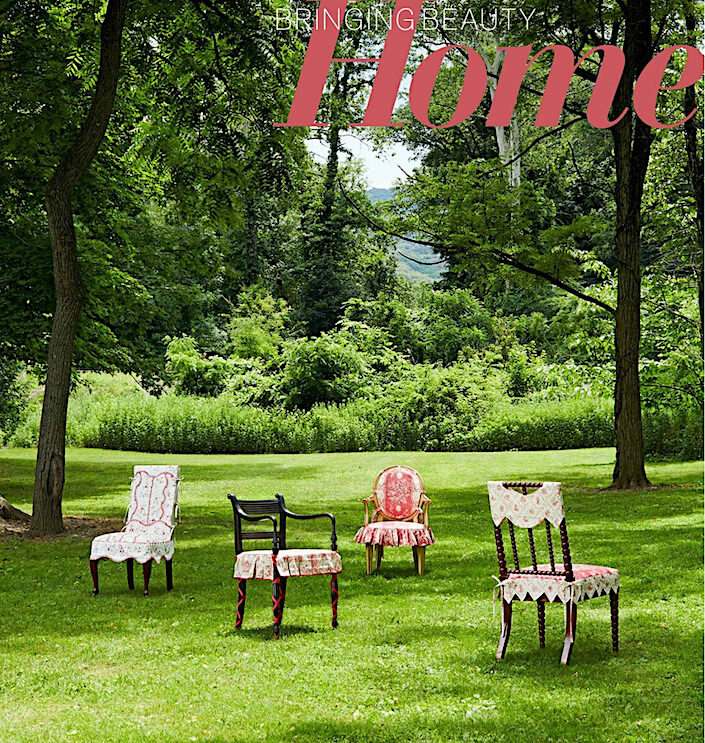 Entry Tags: Christopher Moore, Designer Fabric, Textiles, toile, toile de jouy, Veranda Magazine Bookmark the permalink. 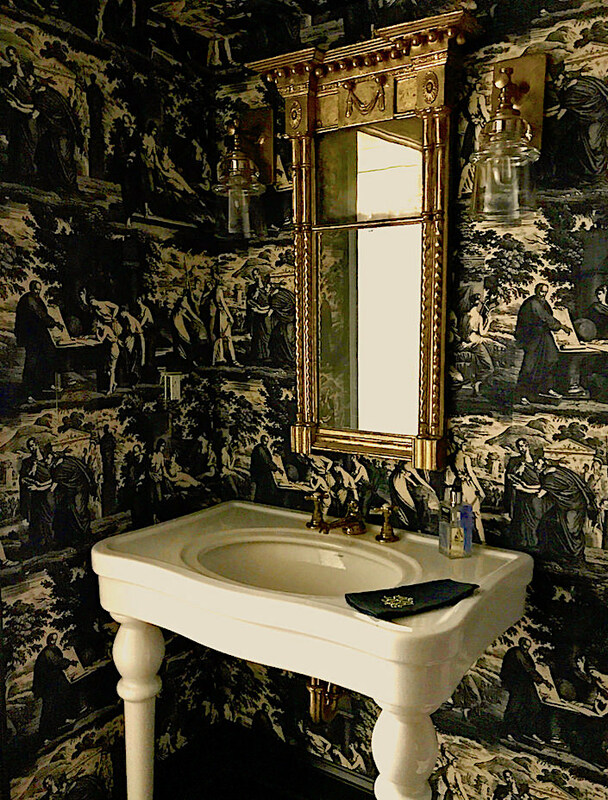 Those dark, dramatic examples (especially your powder room) are fantastic. I like the bedroom less. 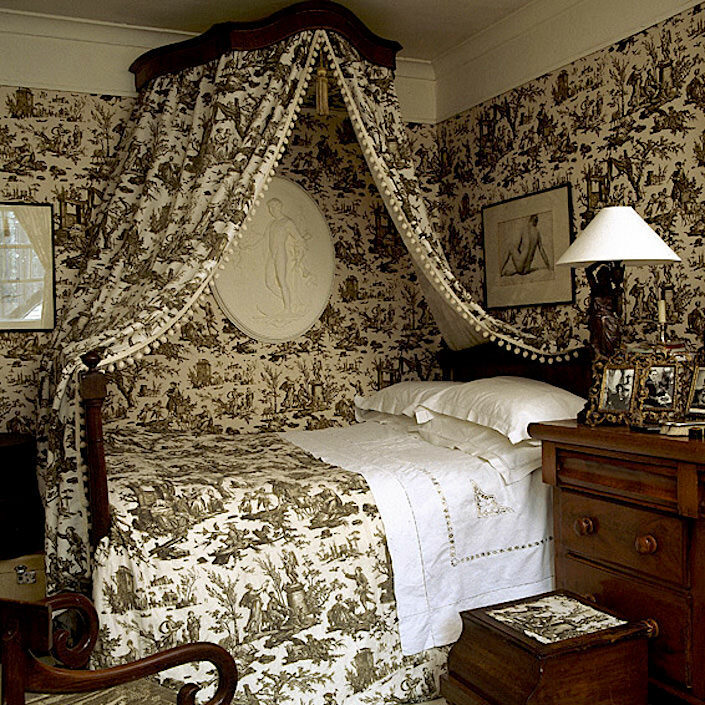 Those rooms with toile on the walls, the curtains, the bedspread….too much for me. But in a powder room, the effect is of walking into a jewelry box. 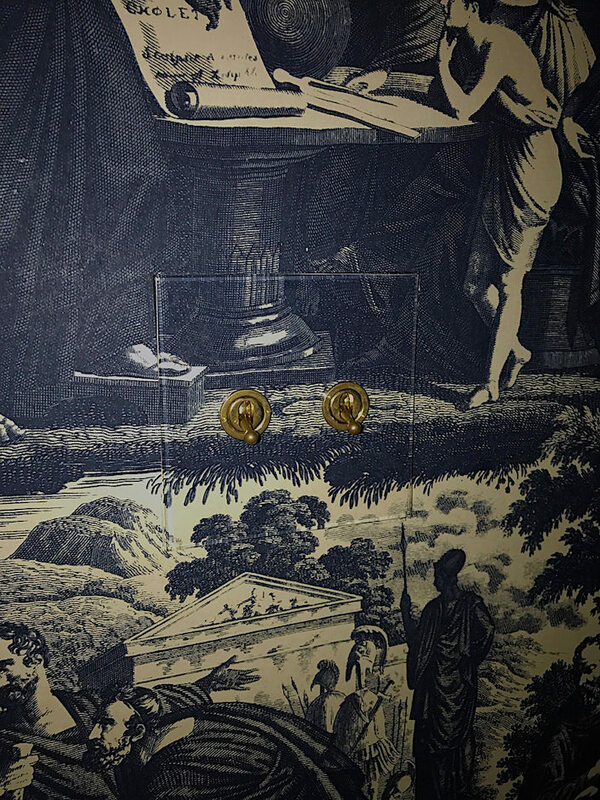 Great article…Toile has always been a favorite and I have collected “bits & pieces” of unusual toile for years. Thanks…I will be on the lookout for Cholet. It is gorgeous and the story just adds to the fascination! I might never leave the powder room. Exquisite. My guest room has cranberry toile linens. And now my stair hall will be in a pale grey toile. It’s so interesting. Your powder room is wonderful. Love the Forbes & Lomax switches and jib doors. Fabulous! Perfect powder room! The details are wonderful. Thanks. Real pieces of art! Wonderful! Where to start??? There is so much to say. Foremost I LOVE the dramatic quality of the toile de jouy in general. Those rooms are so theatrical!!! Thank you for this blog post Stacey . Very informative. Stacey, How fortunate we all are to be educated and enlightened by the various visual connections and story telling devices offered by the modern world. Thank you for the insight into your lovely room and all it’s intimate details. 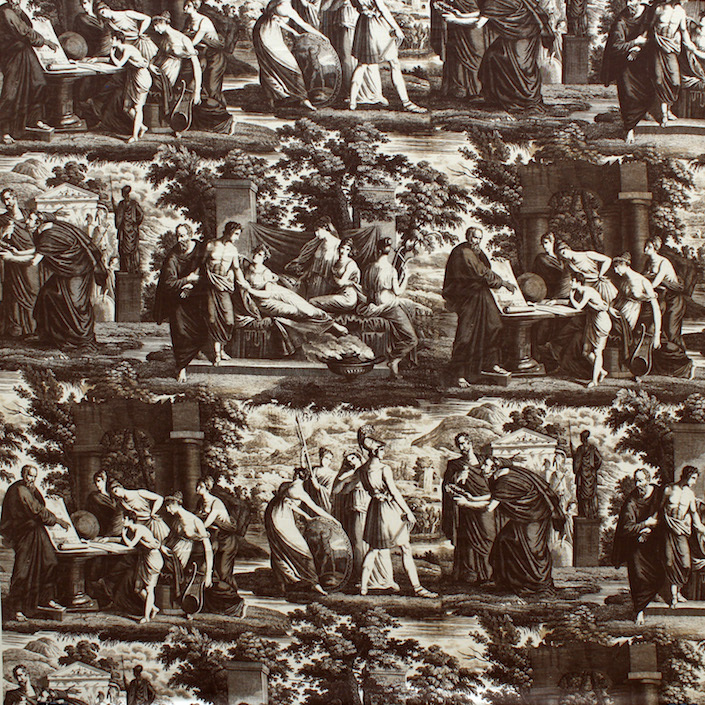 Christopher’s knowledge and expertise in the history of Toile is an education in social, decorative, and historical arts. 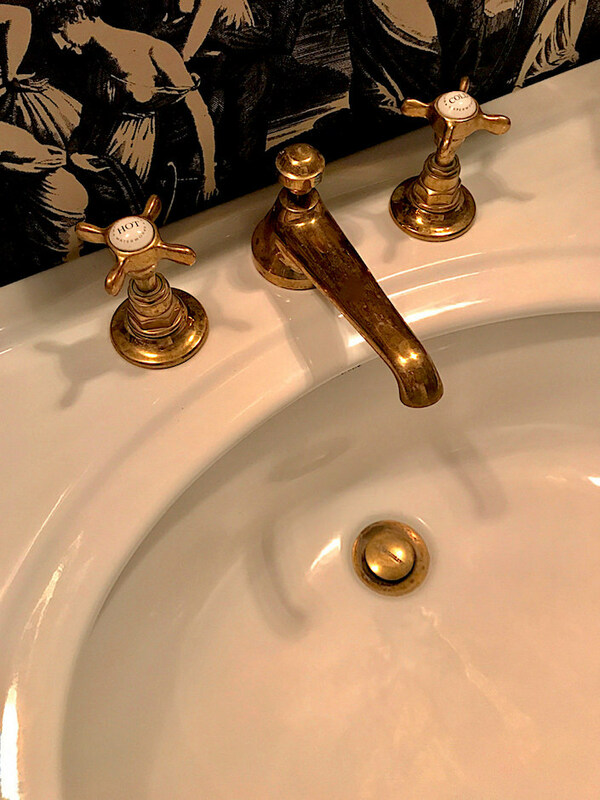 I absolutely love the highlight of Mr. Moore’s personal Toile drenched space. Not an easy decorative achievement to accomplish, yet he succeeds brilliantly. Thank you for this gorgeous post. And you say you’re not a decorator…that powder room is a knockout! 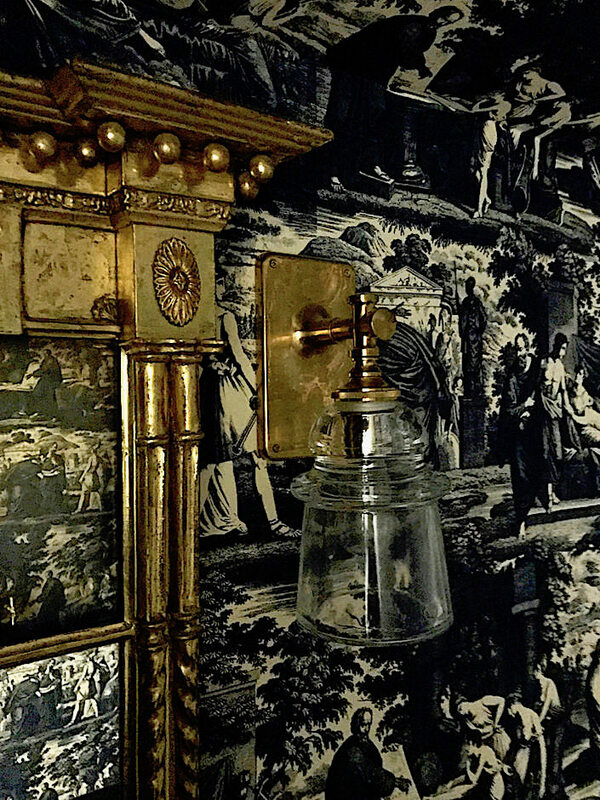 But even more importantly, I love the story and love knowing another toile devotee. Toile has been a mainstay in every home I’ve had; I think I was weaned on it. The only thing I might adore more is leopard, in any form. Thirty years ago I installed some toile fabric of French architectural scenes in our downstairs loo. We added bluestone floors, a wood wainscot and padded fabric. My husband had just designed his first winery for a French client and we had inherited what I considered an unfortunate fleur de lis TP holder from the previous owners of our house. So we dipped it in zinc to match the other fixtures. The lights were fashioned from antique French candle sconces. The French loo remains intact 30 years later…. Not sure how to add a photo or I would send you one…. 80 queries in 0.537 seconds.